The rules for using these Star Players can be found in the May 2017 issue of White Dwarf magazine, or downloaded in PDF form from the Forge World site. There was a little bit of a stir online surrounding the rules for these players as they are a little overpowered, but there are special rules for using them which makes them always show up together on the pitch to oppose each other. So, I guess if each team gets an over powered Star Player, then they just balance each other out. 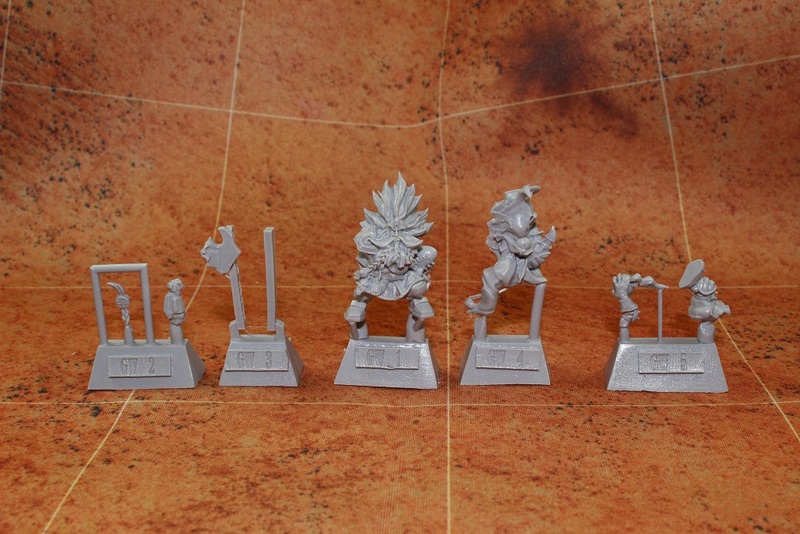 As always, I did not get too worked up over the rules for these guys as I like to see most anything new for Blood Bowl. With all of that out of the way, it is time to get to the minis! Lets start with a front and back picture of the package. Everything looks normal so far! The insert displays all of the same artwork that we have seen many times now. I was, however, a little surprised to see that the insert was only a single front and back sheet, and not a booklet like other Star Players so far. There is no fluff, nor are there any rules or stats for the minis. Better download those PDFs or buy White Dwarf! As to be expected, the back of the insert shows assembly instructions for both minis. It looks like there are only a few parts for each mini. Assembly should be a snap! 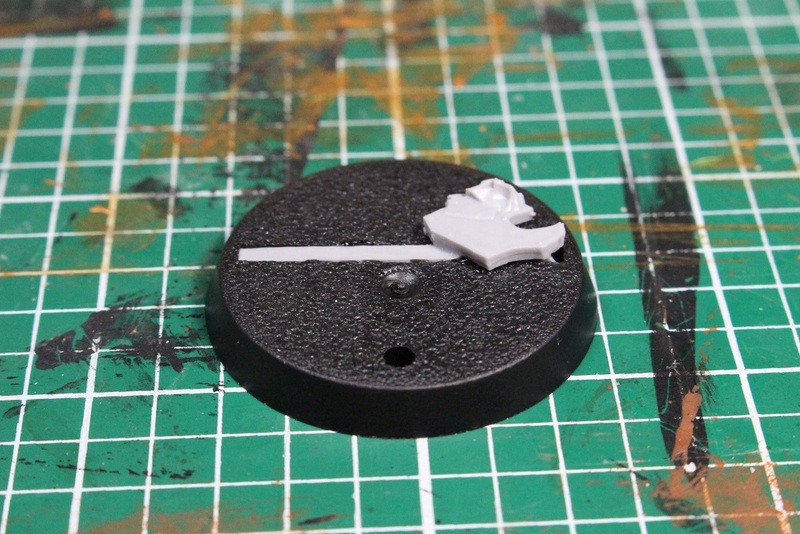 As with every other Star Player pack from Forge World, this one comes with two bases, one slotted, and one standard base. I thought this was a little strange at first, since the pack came with two minis. I would have thought that they would included either two slotted bases or two standard bases. It did, however, end up working out just fine as I will show you shortly. Here we see all the pieces for both minis. 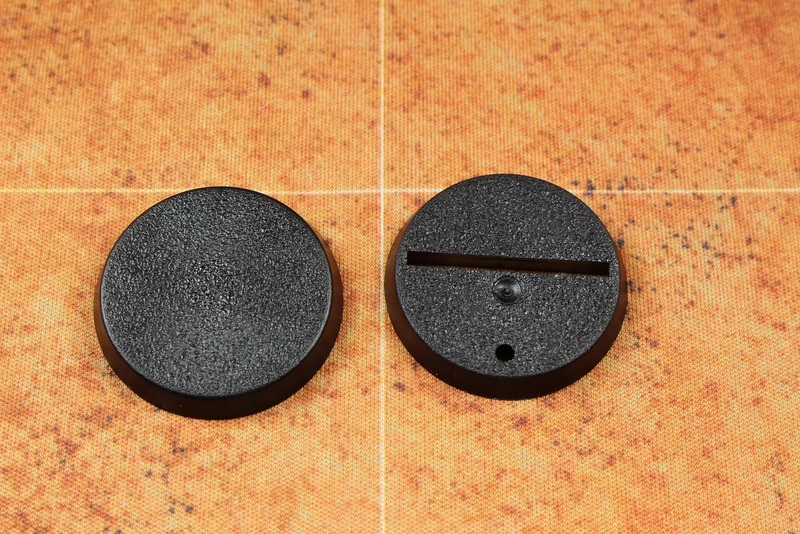 There are only a couple of pieces to assemble on both minis, but I was surprised to see that much like the new Grim Ironjaw mini, these minis came with base tabs… as separate pieces. I really just do not understand this, base tab as a separate piece, thing that they seem to be doing. I definitely like base tabs on my minis, and wish that Forge World would include them on more minis. More specifically, though, I wish that they would come MOLDED ONTO THE MINIS so that I do not have to worry about assembling them. 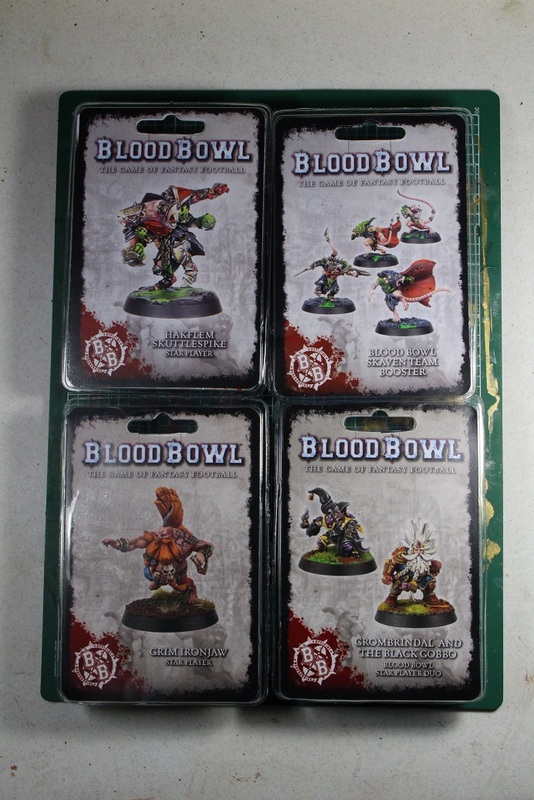 They did it for the Skaven booster pack, why can they not seem to figure it out for Star Players? 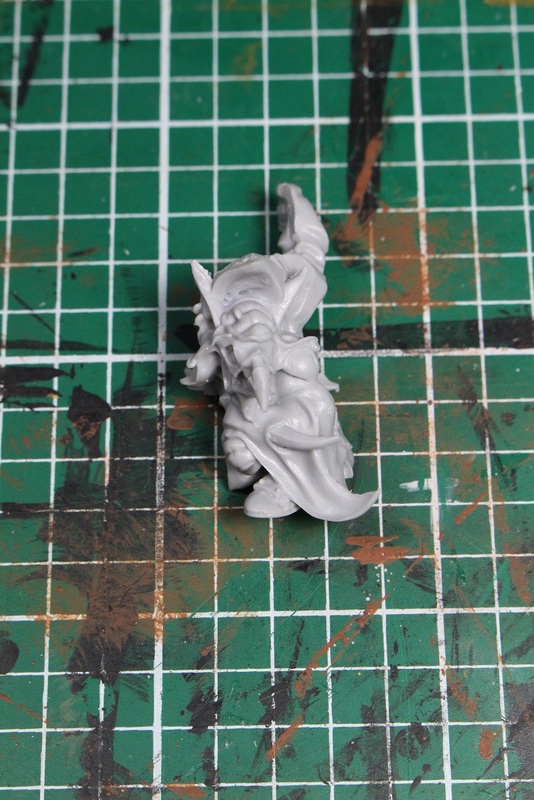 Rant over… After giving the minis a bath to remove the release agent, I was ready to begin assembly. 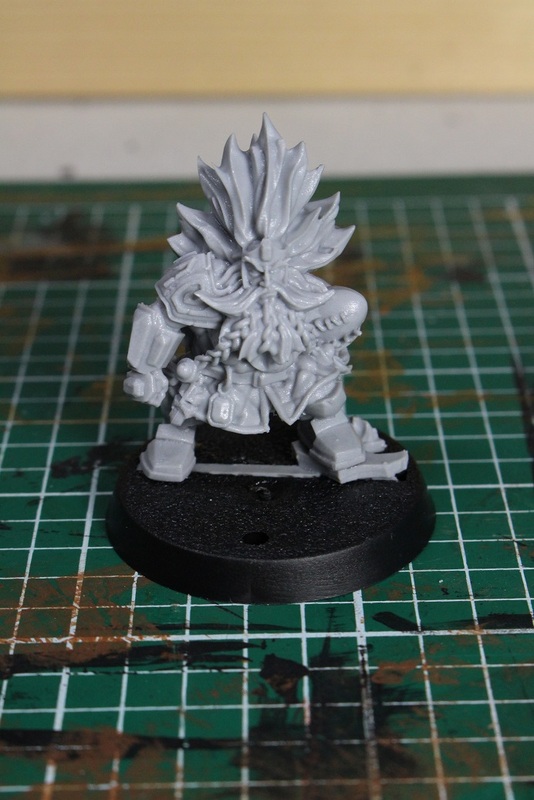 I started with the Grombrindal mini because I was most excited about him, and I am not patient enough to wait. I actually decided to use his base tab as it included a pieces of rock that his left foot sat on. His feet would not sit flush on top of the base if I did not use the tab-mounted rock. 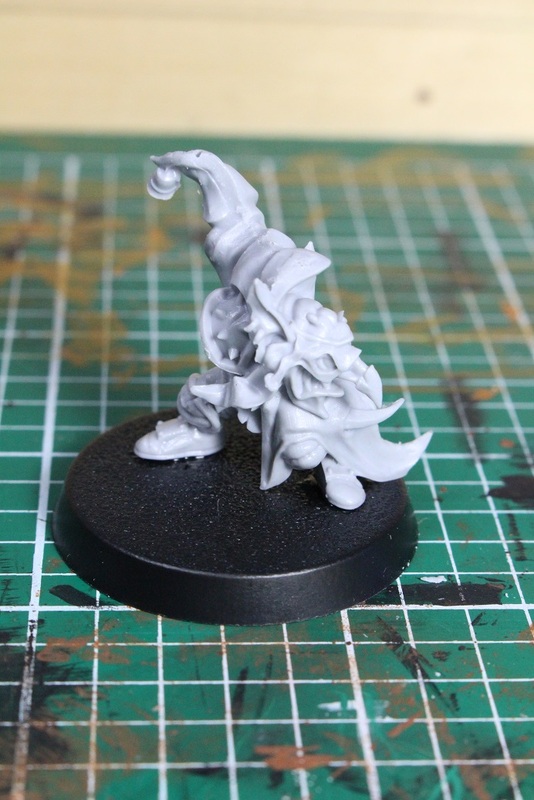 At first I thought about pinning his feet to the tab, but then I realized that surprisingly, Forge World had released a Star Player that was completely flat footed. All I needed to do was glue the tab into the base, then glue both feet to the base and tab and I would have a nice, strong joint. As expected, attaching the base tab was super easy. 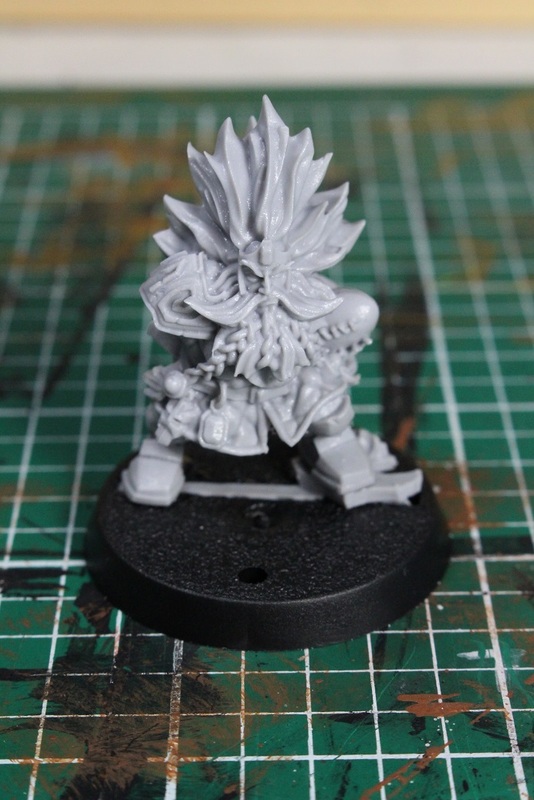 Just a little glue and Grombrindal is standing… with BOTH FEET on the base! Woohoo! The beard braid is a really small piece, and the attachment point for it is only a small divot towards the bottom of his torso. Because the piece is so small, I had to get some tweezers to hold the piece while the glue dried. It took me a couple of tries to get right, but I finally managed it. I do have to admit that I am a little concerned about the strength of the joint over time. I guess I will have to see how well this thin resin piece holds up over time. 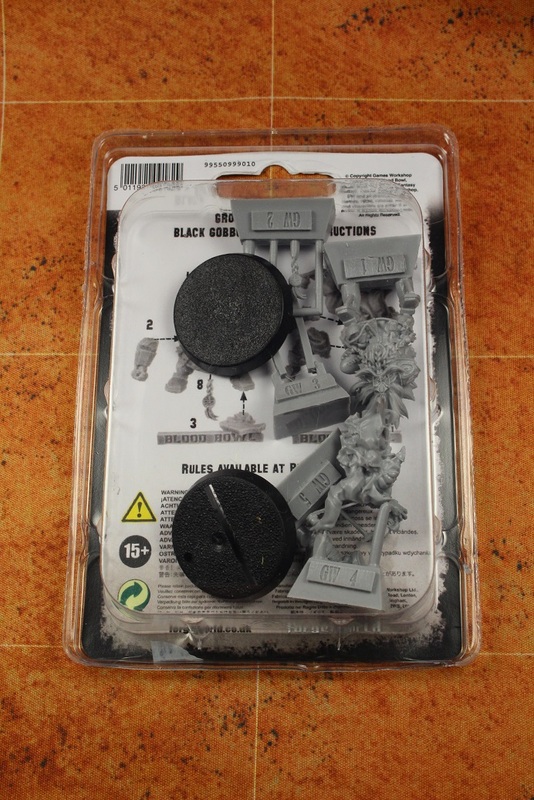 Time to move on to the Black Gobbo! What is this? TWO Star Players from Forge World with BOTH FEET flat on the base? Surely this cannot be! Here is the Black Gobbo finished. This is kind of a weird angle, but that is actually a small bomb he is holding behind his back. If you do not like the gigantic bomb from the new Goblin Secret weapon pack (unboxing coming SOON! ), this mini might be a good alternative for you to try. Even after getting the mini in my hands, though, I still think the pose is a little weird, but it is not too bad. Lets take a look at both minis from a few angles. And a nice shot of both minis together. Finally we will look at a couple of size comparison shots. 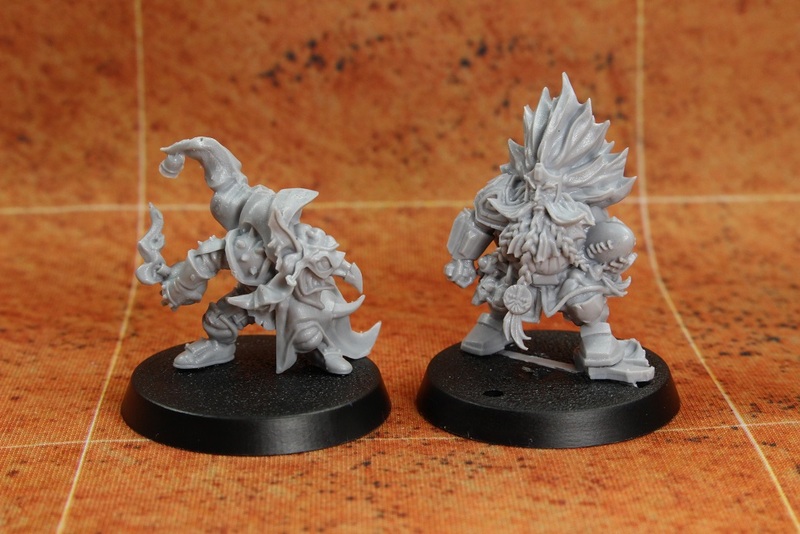 Here is Grombrindal next to the new Grim Ironjaw and a 3rd edition Dwarf Runner. 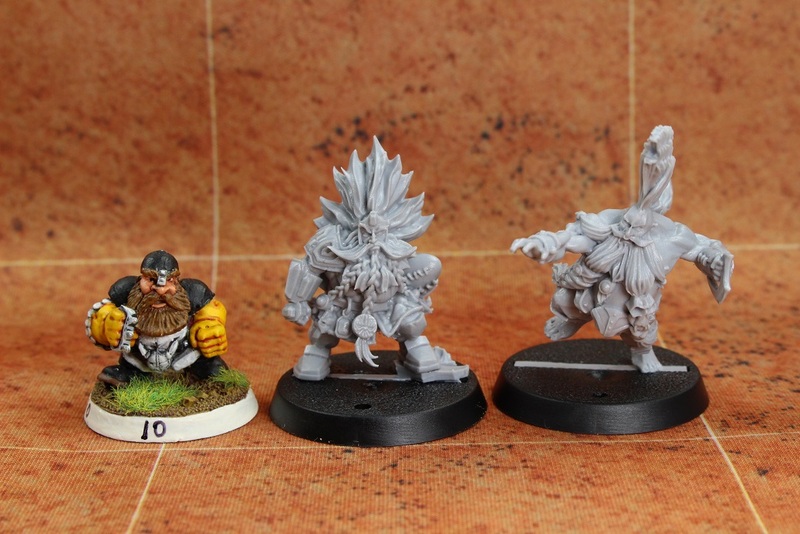 As you can see, even without the hair, he is a bit taller than the Runner, though the Runner is probably the shortest of the 3rd edition Dwarf minis. He is pretty much exactly the same height as the new Grim. 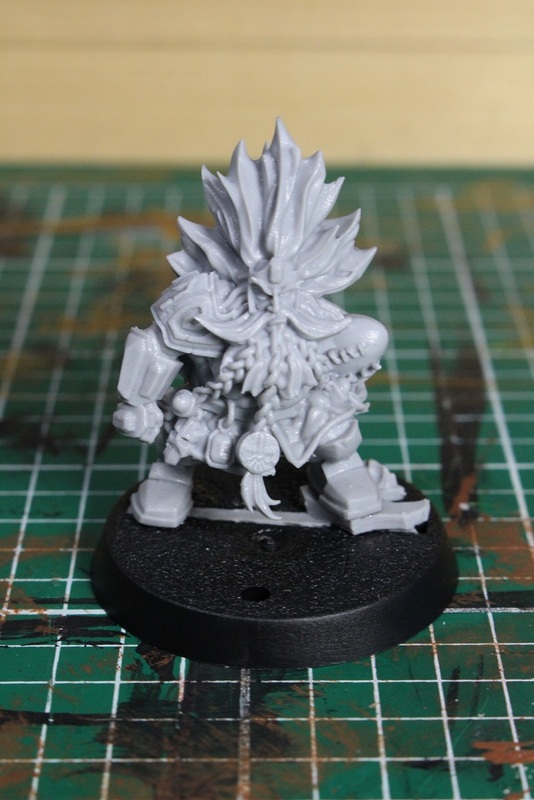 I read someone online say that they wanted to use Grombrindal for their Grim, but they thought he was way too short and they were looking for alternatives. Not sure why they thought Grombrindal was so short… he looks exactly the right height to me. 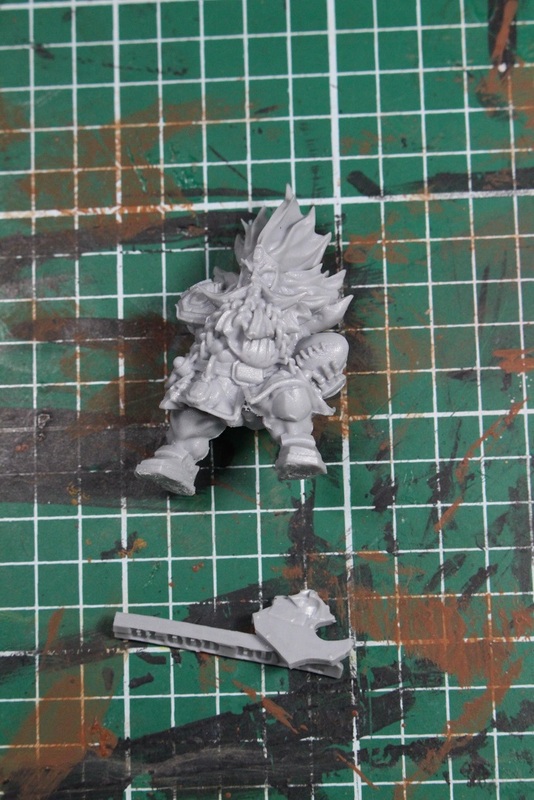 Anyway, to sum up… I really like the new White Dwarf mini, though I am a bit on the fence about the Black Gobbo mini. 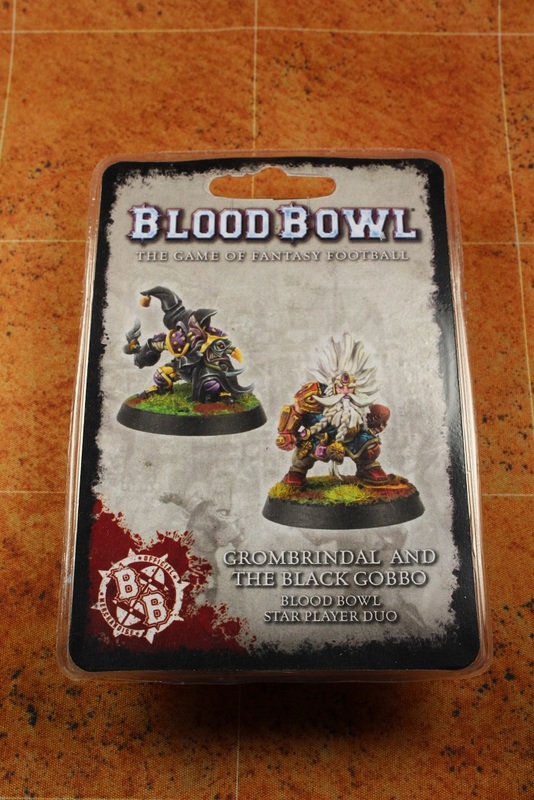 The nature of the minis and their rules make sense for them to be sold as a two pack, but honestly, I am definitely more excited about adding Grombrindal to my collection than the Black Gobbo. 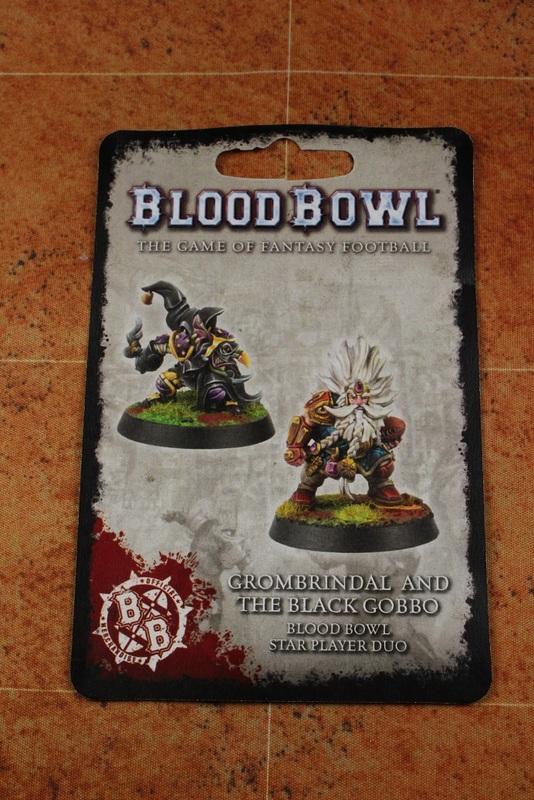 This entry was posted in Blood Bowl, Gaming and tagged Black Gobbo, Blood Bowl, Forge World, Forgeworld, Games Workshop, gaming, Goblins, Grombrindal, Miniatures, Star Players, table-top games, tabletop wargames, wargames, Wargaming, White Dwarf by Mike C. Bookmark the permalink. 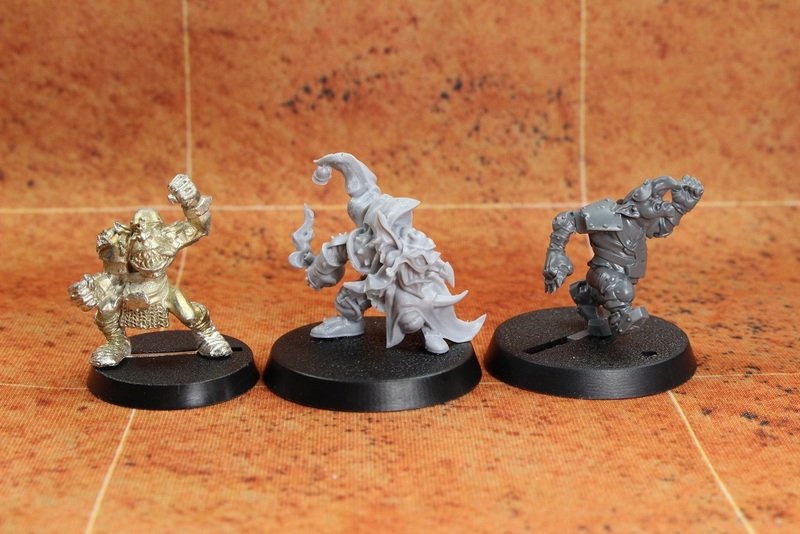 I agree, I really like the White Dwarf model, the Black Gobbo is so-so for me. I’m also not really familiar with the Black Gobbo as a character, he came around in GW’s early experiments with the web right? That was in my period of GW darkness when I wasn’t playing their games or paid attention to them. 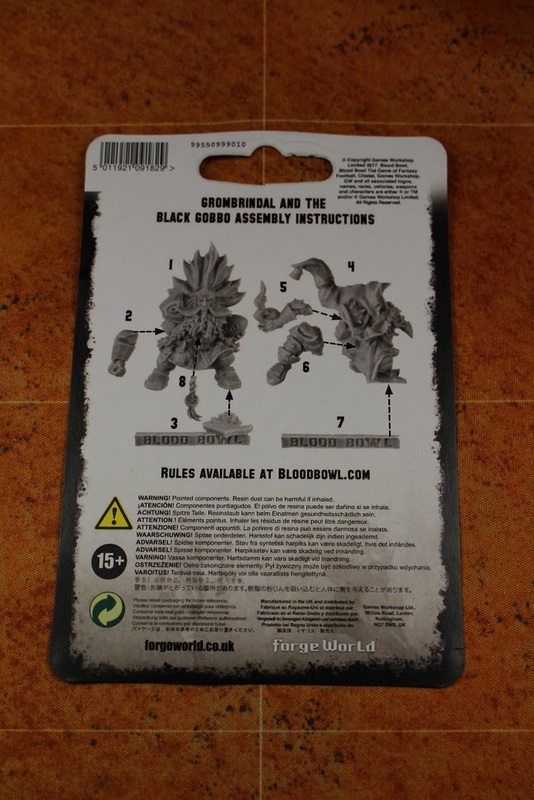 I am not too sure about the Black Gobbo’s origins either. I remember that for a while, there was an online “magazine” that Games Workshop put on their site for free, when they still posted hobby articles and How-To’s on their site. It was a free online companion to the White Dwarf hard copy magazine. I was more partial to the Black Gobbo. But I think I can see what you mean about the pose. White Dwarf looks pretty good. I decided to pass on them, as I wasn’t that crazy about two Star Players who always have to show up together. These “exclusive” Stars are also kind of dismissible, as their rules are separate from the main rule books so far. Since that’s the case, I feel all right about skipping them and focusing on the Stars that are in the rule books. 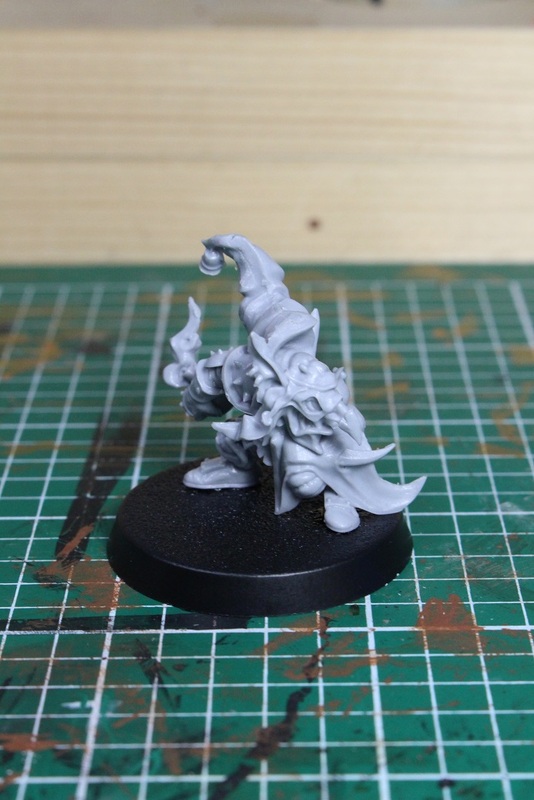 I also am trying to really limit what I buy from ForgeWorld. Partly because of cost and also because I haven’t been really happy with their models. Yeah, this definitely is not a must have set as they are not in the main rules, and have their own special rules. They are nice minis though and I am happy enough to add them to my collection. Long time follower, first time complainer. Best BB-blog as far as showcasing the newest stuff!